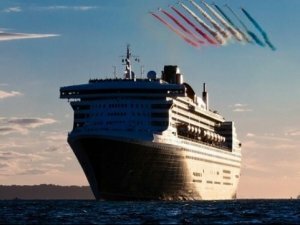 Cunard's three “queens” Queen Mary 2, Queen Victoria and Queen Elizabeth sailed from Southampton on Friday amid a display from the the Red Arrows, the Royal Air Force Aerobic Team. The sendoff marks the first time in Cunard's history that guests had the opportunity to see the Red Arrows flying display while on board. Cunard is the only line to offer regularly scheduled Transatlantic service between New York and London. A new ship is to join Queen Mary 2, Queen Victoria and Queen Elizabeth as the fourth member of the fleet in 2022. Built by Fincantieri and sharing the iconic livery and red funnels, the new 113,000-gross-ton ship will accommodate up to 3,000 guests. Together Cunard, Carnival Cruise Line, Holland America Line, Princess Cruises, Seabourn, AIDA Cruises, Costa Cruises, P&O Cruises (Australia) and P&O Cruises (UK) operate 102 ships visiting over 700 ports around the world and totaling 226,000 lower berths.